Vanilla Bean Ice-Cream – Paleo, Primal, LCHF & Keto Friendly! It’s summer in New Zealand – well, in Auckland it is sort of summer some of the days. Regardless when you are hot then the ultimate treat has to be ice cream! 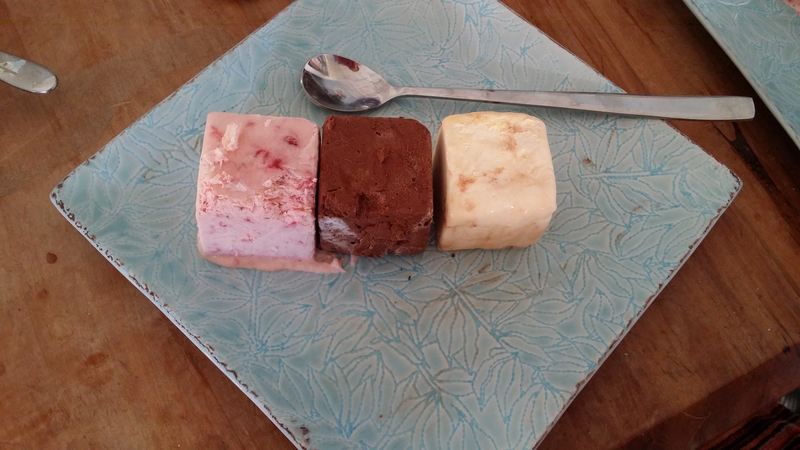 And what better way to start off the blogging year is to talk about ice cream. And an ice cream so low in carbs they call it Keto ice cream! My sister Kathie made this on a recent visit. She found it on Martina’s Keto Diet Blog. And adapted it with a strawberry and a chocolate flavour. The recipe uses sweeteners and I favour a Stevia/Erythritol mix which is reported not to raise blood sugar levels. I also use half the amount in the original recipe. A good hint is to place the finished mix into mini silicone muffin trays so each little ice cream pops out easily. To make sure texture is smooth and creamy beat the sweetener in a little at a time and beat well. Strawberry – mush with a fork 125g strawberries and stir into 1/3 of the finished mixture. Chocolate – melt 50grams of dark chocolate (85%) and stir into 1/3 of the finished mixture. Or just top each with a slice of strawberry (fresh or freeze dried) and the rest with shaved 85% chocolate carefully stirred in once you have the mixture in the silicone pans. Now head over to KetoDiet Blog for the super easy directions on how to make this.